3. Copy the relevant files from Registrations for the Events Calendar into the “email” folder you just created. 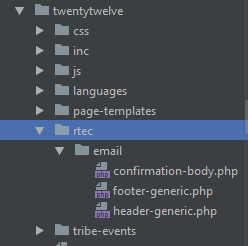 The files are all found in the templates/email folder (confirmation-body.php, header-generic.php, footer-generic.php).